Properties in Province of Palermo average 4.6 out of 5 stars. "Lemon Cottage apt inside Villa Trabia - Villas for Rent in Bagheria, Sicilia, Italy"
Property 4: "Lemon Cottage apt inside Villa Trabia - Villas for Rent in Bagheria, Sicilia, Italy"
"Orange Cottage apt inside Villa Trabia - Villas for Rent in Bagheria, Sicilia, Italy"
Property 5: "Orange Cottage apt inside Villa Trabia - Villas for Rent in Bagheria, Sicilia, Italy"
Property 9: La Gisamìa. Pure Nature. 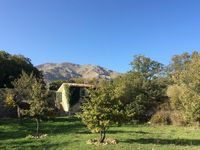 Property 14: La Gisamìa. Pure Nature. My girlfriend and I stayed 4 nights at the House of the Pomegranates which is the smaller of the two properties. 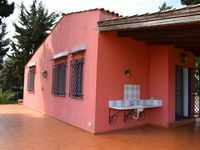 It's a beautifully restored stone cottage that is essentially one room with a small kitchen area, a table to eat at, a pullout sofa that is also your bed and bathroom with a nice shower. The kitchen is well stocked with everything you need, and we cooked several meals at home, taking advantage of the fresh herbs in the garden and wild fennel that grows everywhere. The property is perfect for relaxing, with lots of spots to sit with a coffee, read, write, think. After a week of hot weather and road-tripping around the western and southern coast of Sicily, this was a perfect respite. Breezy mountain air, sunny days and cool nights, quiet, cozy, and extremely peaceful. It's well situated for exploring the Madonie region, with plenty of nearby hikes, scenic drives, and beautiful mountain villages to explore. Ferdinando was an exceptional host. We were welcomed by a basket of fruit and snacks, and a detailed list of recommendations for hikes, outings, and restaurants. He went above and beyond to accommodate all our questions and was always very quick to respond and easy to communicate with. We would highly recommend this spot to anyone! Make sure you look at the photos specifically in the listing since they show both properties, and one is larger and one is smaller. Stayed for 9 nights in early sept. 2012. First thing you notice is the view. 5 star , panaramic view of the bay. Nicely placed in olive and lemon grove. The cottage has almost everything you need apart from - Terrace furniture cushions.&amp;amp; some info about shopping / local area etc. The staff and cleaners from the main Villa are very helpful and polite. Food at the Villa is also 5 star , both Breakfast &amp;amp; Dinner. The pool is fantastic. Check out is 10.00 and NOT 12.00 as stated on our voucher. It is not at all suited for small children. There is a railway line 50m at the back of the cottage. First train is about 5.45 am and shakes the bedroom ! The terrace handrail is in very poor condition / dangerous and need repairing. there is a slope / drop into the olive grove. There are snakes and bats in the surrounding groves.